1. Use a tested & approved recipe. The reason you can't just do what you want here is because the vegetables bring down the acidity of the tomatoes. All those onions, garlic, and peppers are low acid and generally need pressure canning. When you use a tested & approved canning recipe, it balances the acid out with vinegar and/or lemon juice so that your salsa is safe for water-bath canning. Some great recipes can be found here and here and here. Don't forget Salsa Verde. 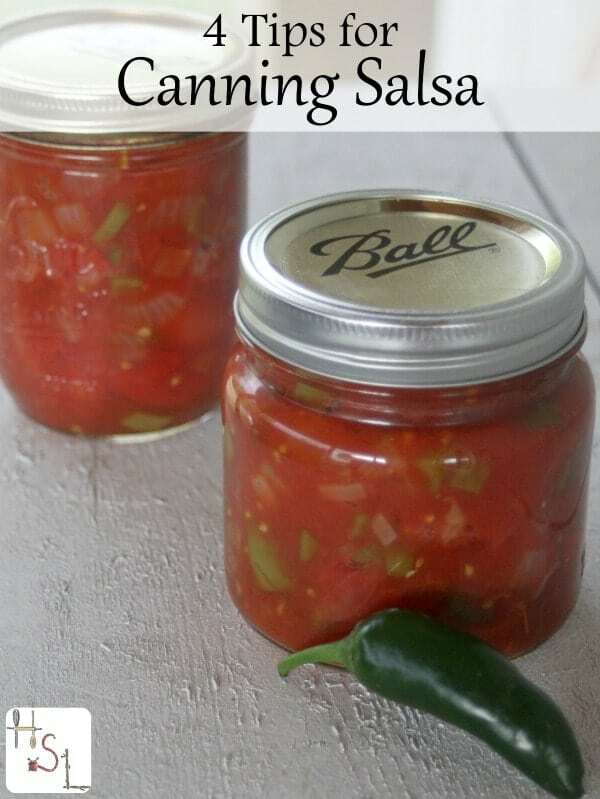 My favorite canning book is: Ball Complete Book of Home Preserving by Judi Kingry and it has some fun salsa recipes including those with fruit instead of just tomato. 2. Home-canned salsa is rarely chunky. I've never been able to home can a super chunky salsa. The heat from the canning process simply makes the tomatoes release water and juice. I've learned that a lot of the commercial companies use green / unripe tomatoes that they gas to turn red to keep it chunky. Just keep that in mind as you process salsa at home. I know all the tested and approved recipes tell you that you should. I did it for years myself. Last summer a fellow canner told me that she never peeled her tomatoes for salsa. I gave it a whirl after that and I'll never peel tomatoes for salsa again. Yes, you get a few little bits of peel in there but honestly not that many and I didn't notice any bitterness or flavor change. I'm sure this would drive a purist crazy but when you do a ton, you look for short cuts. Well, I do, anyway. Speaking of doing a ton – salsa especially, in large quantities requires a bunch of chopping. I do all that prep work ahead of time, I chop onions, peppers, and garlic so that they're ready when I am. The chopped veggies will keep for at least a week in the fridge and I just do a bunch of that chopping and keep it in containers, when I want to do up a batch or two of salsa after work all I need to chop is the tomatoes and toss everything into a pot. Salsa isn't a difficult thing to process or mix-up but it can take some time. I do encourage novice canners to give it a whirl. It's super satisfying to pop open that jar of home-canned and if possible, home-grown, salsa in the middle of winter. Great suggestions for salsa, Kathie! I agree that making your own salsa is one of the best things about canning. I never peel my tomatoes, either, it definitely saves time and doesn’t make much of a difference in the quality. I canned 40 pints of salsa with a friend a few Saturdays ago. We nearly went cross-eyed from all the chopping so doing it ahead of time is a great idea. Thank you! Wish I’d seen this on Sunday, when I was making salsa and missed most of the Patriots’ home opener to peel tomatoes. Pre-chopping and not peeling the tomatoes will save a lot of time and make it realistic to do a batch on a week night. The canning itself is pretty quick–the chopping is what takes forever. Thanks for the great tips. I hadn’t thought about the “Chunky” issue. Good to know! Sharing on facebook and pinning!